The Grand was built to be an opera house. Of course, Texas never took that designation seriously. 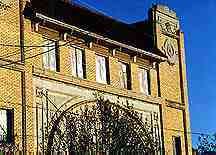 All around the state, opera houses served a variety of functions. On rare occasions an opera may have actually been performed, but it was dances, political functions and vaudeville that paid off the mortgage. Electra's first theater was the Air Dome. This was one of an unusual type of theater that was widely known, especially in warmer climates. Walls were built, but there was no roof. Matinees of course were not shown. There was a "half roof" extending over a small rear portion of the seats in case of rain. 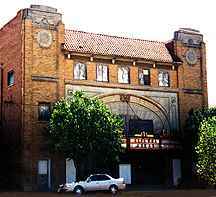 Other theaters in Electra over the years have included the Crown, Dixie, Liberty, Garden and Roxy. The Roxy is singled out for the reputation it had for the poor condition of their prints. Breaks in the film were so frequent that the audience started chanting Roxy! Roxy! until the broken film could be spliced back together. Its reputation was set in stone when film breaks in other theaters would receive the same chant of Roxy! Roxy! The Grand had 6 loges, just in case they did host an operatic performance. Like most theaters of its day, there was a pipe organ to accompany the silent films. Jack Teagarden, trombonist of the 30s, 40s and 50s, played in theaters like the Grand early in his career, accompanying his piano-playing mother. Since the family was from nearby Vernon, it's entirely possible that they occasionally played at the Grand. Tax records for 1923 show that Martha McSpadden, who had formally worked for the Liberty Theater, was the manager for the Grand. She assumed ownership of the theater in 1946, but not before she influenced the outcome of WWII. Mrs. McSpadden insured that theater employees contributed their share toward buying war bonds. In a letter sent to Electran men and women in the military, Mrs. McSpadden informed them of the impressive quotas that were met. The Fifth War Loan Campaign had a quota of 295,000 dollars. In total, all loans from Electra equaled over one million dollars! The Fifth War Loan received $165.00 for every man, woman and child in Electra. Not a small amount in the 40s. The letter also says: "�and somewhere in the world a Flying Fortress named "The City of Electra" is carrying bombs to the enemy because we oversubscribed the Third War Loan Drive." 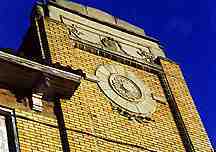 On at least one occasion during the war, the theater was closed "until all employees return from donating blood in Wichita Falls for our men and women serving." Another "small town courtesy" came about when Mrs. McSpadden heard of the low budget of the junior class of the Electra High School. The tradition (imagine this today) was that the junior class give a graduation gift to the outgoing seniors. The gift was a special party consisting of a dinner and a movie. But one year, the money would only cover the dinner. When the problem was explained to Mrs. McSpadden, she invited both juniors and seniors to the movie as her gift. There's nothing new under the sun. Applause signs may have been introduced in New York, but Mrs. McSpadden, who owned the theater in the 40s, came up with a cheap substitute. Since the Grand's patrons had a reputation for being hard-to-please, "applause starters" were strategically placed in the audience to "prime the pump" and help convince Electrans that they were having a good time. The Grand was sold after Mrs. McSpadden's death and has changed hands many times before being deeded to the City of Electra in 1990. 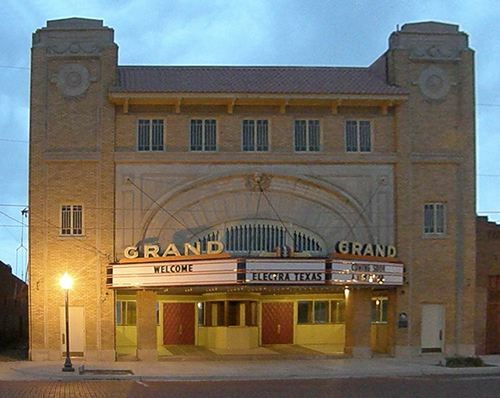 The formation of the Save the Grand Foundation has insured that the theater will remain a part of Electra's (and Texas') history. The detail-rich history of the Grand Theater that we wrote this article from was written by Jan Greer Ekrut, a former Electran now living in Austin. Main Street Program Manager Jannis Hayers promptly furnished this text so that we might present it for our October Drive-By Architecture. We were fortunate to have native Electran, Bob Holman, furnish us with the exceptional photographs he has taken of the Grand Theater.